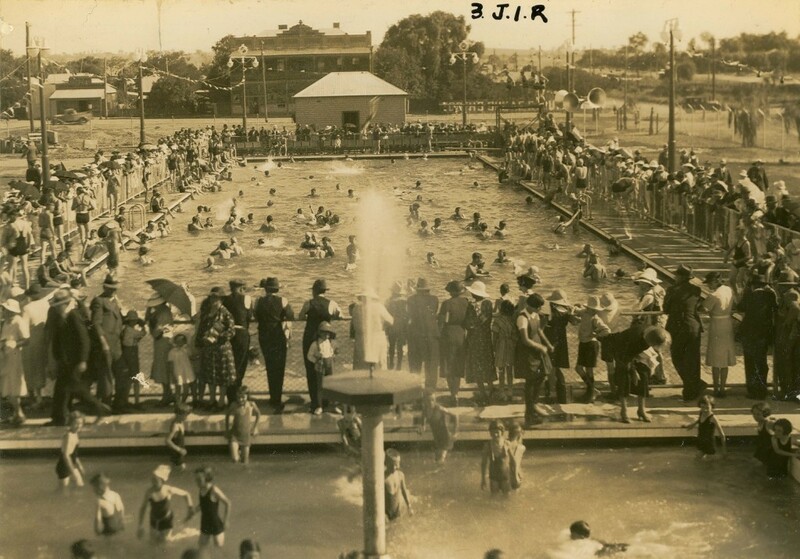 Let’s try to keep that summer holiday feeling with a picture of Junee swimming pool bustling with swimmers and onlookers! There are quite a few clues to the date of this photo. Is this the opening of the “baths”, Wed 16 Feb 1938? There are a lot of well dressed people watching people just have fun in the pool. There are people diving but if it was a competition the pool would be clear of the public. The bathing costumes fit this time too. JUNEE.-The Minister for Agriculture (Mr. Main) yesterday opened the Junee swimming-baths, which cost £12,000. Mrs. Payne, of St. Kilda, wife of Mr. N. Payne, manager, made the first dive, which was the signal for the public to enter the pool. There are lots of articles on TROVE re the Junee swimming baths. Seems there was also a huge council dispute as to where it should go too! Today the pool has become a Rec Centre. The building in the distant background is the Locomotive Hotel on Hill Street – a lot older than the pool. Thanks Debbie – excellent deducing – that could well explain the large numebr of well dressed non-bathers at the pool! Great start – that at least gives us a “later than” date.